There’s something about the 2017-18 Denver Nuggets. In the case that they miss the playoffs, one would be hard pressed to think of a more entertaining or talented team to have watched the NBA’s postseason tournament from their couches. They can’t make it easy on themselves, but they thrive with their backs against the wall. They did it again on Monday night. Gary Harris returned to action as the Nuggets won one of the ugliest games of the year, 88-82, over the Portland Trail Blazers. “It wasn’t pretty,” Malone told the media following the game, “but I couldn’t be more proud of our guys.” The first half of that quote is an apt summary of the slugfest that took place in the Pepsi Center, but the second half is what resonates — of course Malone is proud, the Denver Nuggets just won their sixth straight basketball game. With just two games remaining, execution had all but fallen to the wayside — Malone and his gang are in the results business now. Wins and Losses are the only statistic that matter, and Denver just put up the biggest ‘W’ of the season. The first half featured horrendous shooting from both teams. The Nuggets half court offense was operating smoothly in the first 24 minutes, but the shots weren’t falling. They would have been in big trouble, but Portland was even worse from the field. It’s a rare night when neither Damian Lillard nor CJ McCollum have it going — but Portland’s stars were ice cold in this one. Their entire roster was. Denver’s initial defense was spectacular. They fought through every screen, contested every jumper like their lives depended on it, and funneled Portland’s ball movement to the shooting-challenged Evan Turner. He bricked three-after-three, and Denver might have pulled away in this one — their own poor shooting notwithstanding — if not for the Bosnian Beast lurking in Portland’s paint. Jusuf Nurkic gave it to the Nuggets again. 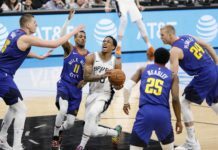 Despite their poor shooting, Portland mugged the Nuggets on the offensive glass and created countless opportunities for second chance points. It was a collective effort from Portland, but a remarkable one from Nurkic — he collected 6 offensive rebounds in the first half and he helped his team to a slim lead at halftime. Like most NBA games though, this one really started in the third quarter. Roughly halfway through the third, Portland had pushed their lead up to nine and they were flirting with breaking this game open. It wasn’t the result of an improved half court offense, they were still bricking shots, but they were inhaling offensive rebounds. It was borderline comical but mostly deflating for the Nuggets faithful and the players themselves. They simply couldn’t rebound the ball. The Pepsi Center had fallen silent. The sense of urgency that defined the Nuggets’ first half effort had dissipated and the team found themselves ball watching and staring at each other in an apparent complete loss for answers. With 6:35 remaining in the third, Denver forced a stop and and pushed the ball down the floor. Jokic found a cutting Murray who rose up to dunk on the entire state of Oregon. He missed and what followed might have been the most important play of the game. Nuggets head coach Michael Malone charged onto the court with a fury that could be felt by those in the ‘300 level’. He made it known that he thought Murray was fouled and he drew one of the quickest technicals in Nuggets history. The crowd rose to their feet for the first time in the quarter and applauded the passion from their head coach. Malone was livid. The crowd was reinvigorated and the players were in turn. That defensive tenacity they had displayed in the first half returned and they made a strong push to close the third quarter. They’d win the quarter 24-20 and cut the lead down to just three as the game’s final chapter began. Once again, a high leverage, high-stakes game in the Pespi Center came down to the final minutes — what else is new? Nikola Jokic had a rough first half. Despite collecting tons of assists he struggled to hit his shots and he couldn’t contain Jusuf Nurkic on the glass — but Denver’s best player came to life when it mattered most. 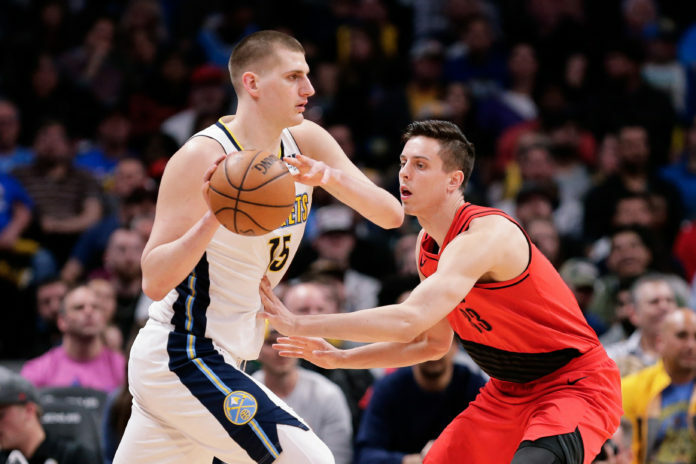 Jokic went off for 10 points, six rebounds, three assists and one steal while only turning it over once. Slowly he began to turn things around for the Nuggets. 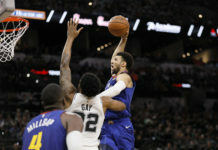 The strong defense continued and Denver finally protected the glass in the final quarter — they allowed just two in the final 12 minutes despite conceding 18 total in the game. Nuggets fans and Blazers fans alike were almost certainly expecting something that never came — ‘Dame Time.’ Lillard, one of the NBA’s most feared closers, never got it going in this game. He was cold from the field and he passed on multiple open looks. He seemed out of rhythm and even his biggest shot of the game — a layup through a Murray foul to cut the lead to three with 72 seconds remaining — was followed by a missed free throw. That missed opportunity cost Portland big time. Lillard couldn’t close the gap for Portland in the final minutes. No one could. 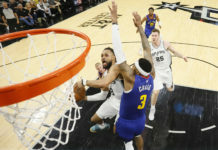 In the final three minutes and thirty six seconds, Denver engineered five stops, created one turnover and prevented the Blazers from picking up a single offensive rebound. The Nuggets did virtually everything wrong for 36 minutes, but they executed in the final 12 as they picked up the 88-82 win. The other Western Conference Playoff hopefuls all won their games, slamming all back door routes to the playoffs shut on the Nuggets. But the win keeps their hopes alive and they’ll play for all the marbles in Minnesota on Wednesday night. The final game of the season tips off at 6:00pm MT.